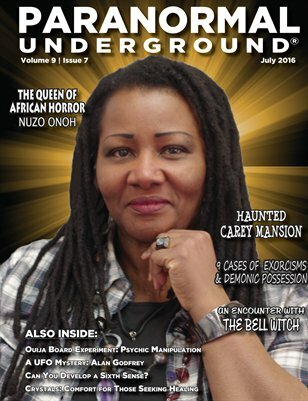 In this issue of Paranormal Underground magazine, we spotlight the Queen of African Horror Nuzo Onoh, the haunted Carey Mansion, a UFO mystery with Alan Godfrey, and nine real-life cases of exorcisms and demonic possession. We also take a look at a recent Ouija board experiment, if anyone can develop a sixth sense, how forgiveness can set you free, and an encounter with the Bell Witch. Plus, we discuss the healing that comes from snakes, dream interpretation, and crystals and stones that help with healing. And don’t miss our features about paranormal investigator and author Nicole Strickland and a paranormal investigation at a haunted boutique. For a 12-month digital subscription to Paranormal Underground magazine, visit www.paranormalunderground.net!